I searched while saving for months, with hope of discoverring the "right" rug. Is there truly a "right" rug? Rugs are tricky; adding a contemporary rug to a traditional space provides edge, excitement, flare; tin he dinging room below Mark D. Sikes uses a leopard print rug as a base to his mirrored clad California dining room, paired with an antique chandelier, leather dining chairs, and a casual blue and cream striped table cloth, the room has an interesting pairing of texture, patterns, also surfaces (leather, shine of mirror and crystal, bronze frame of the chandelier, natural element of the bamboo shades, as well as the leopard print, also the gardens outdoors, repetition of blue and white in the porcelain and the cloth). This room definitely has an edge. Brilliantly executed. I adore Mark D. Sikes, can you tell? 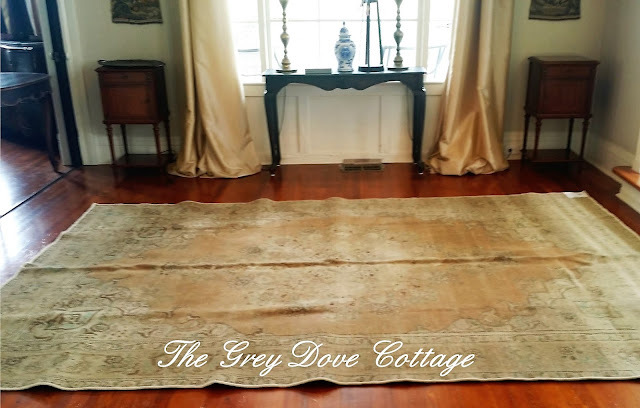 Using a natural fiber rug provides texture; monochromatic rooms depend upon texture, there isn't a rug with more texture than a jute or seagrass woven rug. 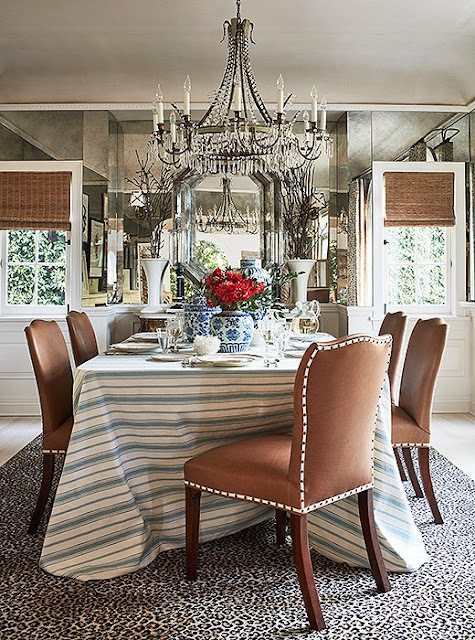 Below Tara Shaw pairs a woven sea grass rug, layered with a cream cow hide in a neutral dining room. The result is a combination of textures, as well as shape; the woven rug in typical rectangle defines the parameter of the dining space, then serves as a backdrop to the organic outline of the soft, velvet like hide. The antique burlwood table provides a bit of color, also texture while the, metallic ceiling finish, antique chandelier, and antique mirrors give a reflective shining surface. 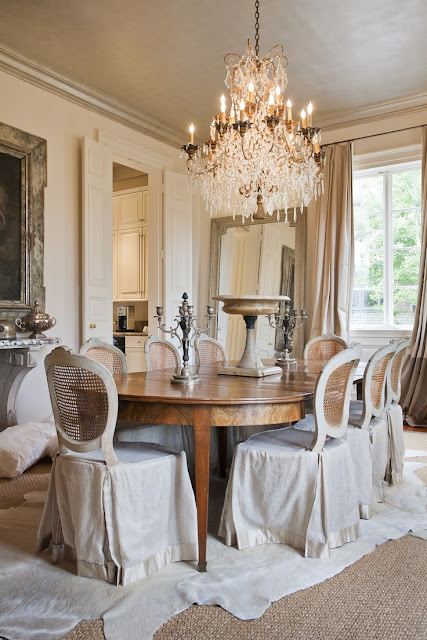 Antique French chairs dressed in linen skirting edged in satin, again give a combination of natural element, texture, also shine. At center stage upon the table a simple concrete urn provides a classic shape with a rustic feel. The linen drapes hung from iron rods tie to the chandelier frame, as well as the antique candelabras upon the table, once again adding a natural, rustic elements. All of these pieces work together to make a neutral room have interest. 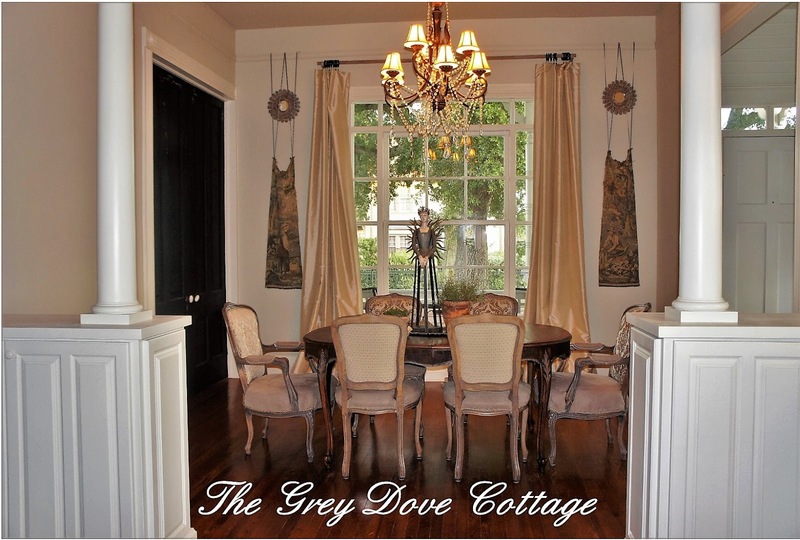 There is nothing boring about this well thought out, layered, neutral space. Again, perfection. Tara Shaw is the essence of French design. Many designers use the rug as their first design element for a space; color pallet, coordinating fabrics, creating a room around the rug. 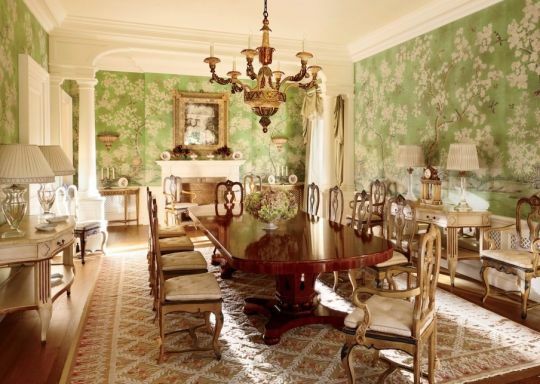 Below David Easton pulls the color pallet from the rug; the green background in the floral wallpaper, chair cushion fabric, finish upon the wooden chandelier, also serving consoles. The rug's lattice pattern creates a beautiful base to the garden theme of the room. David Easton, a masterful designer. 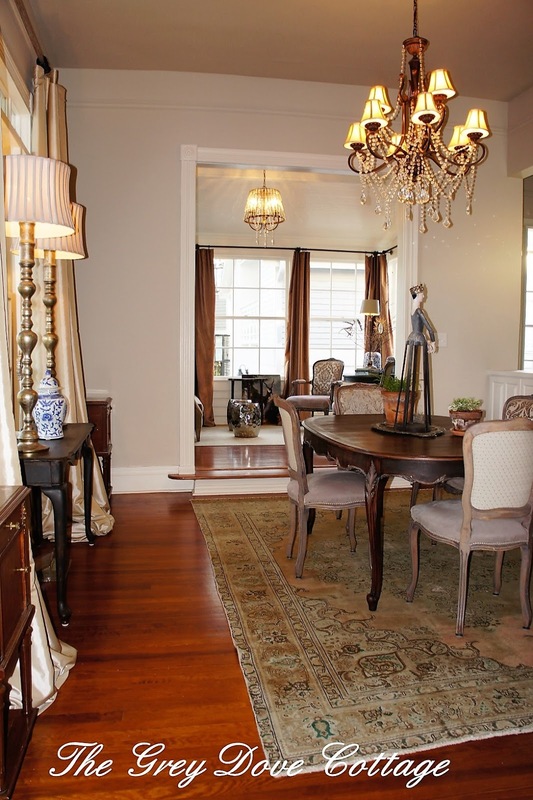 Needless to say, a rug is an enormous choice, with that choice comes a great deal of pressure. Rugs are expensive. 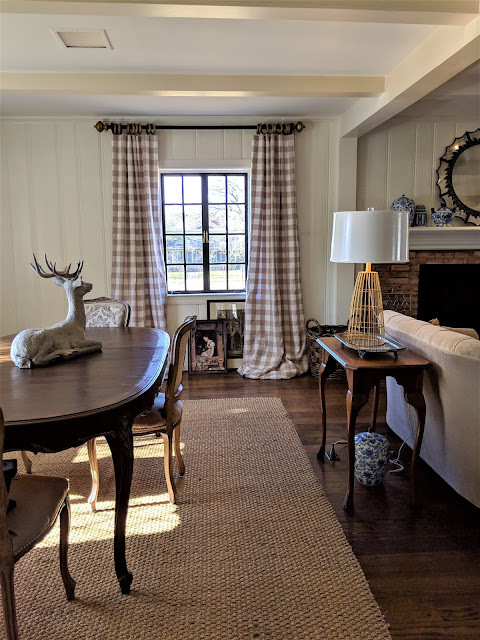 When it came to choosing a rug, I had to make a decision upon what I wanted the rug to do for the space; color, texture, pattern. Should I chose new with rich color, maybe a contemporary design element, or antique with a faded worn patina? French style design can be at times a bit boring. 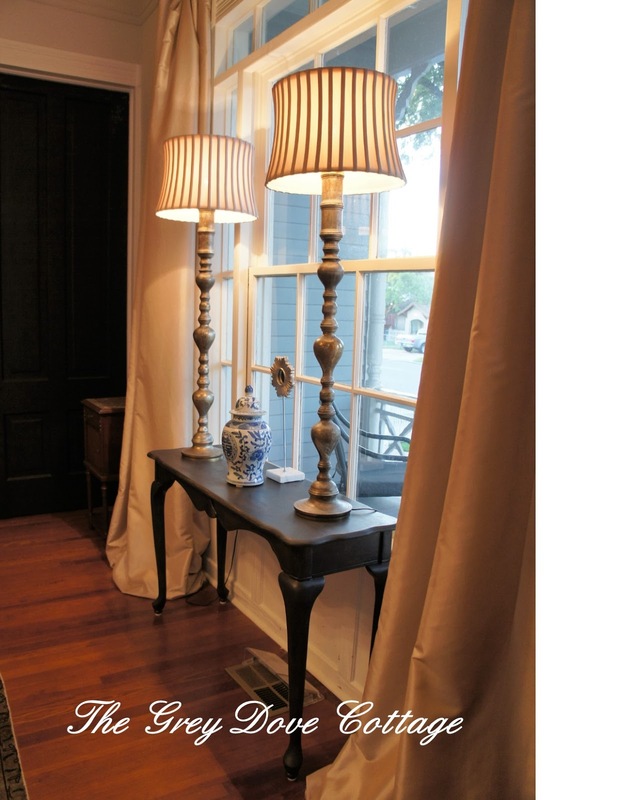 Layering is key to a French room, the style itself is known for natural elements, the combination of slick porcelain against rustic, peeling paint upon a antique console table, linen paired with velvet. Since the rug did not come first our room already had many elements to consider. 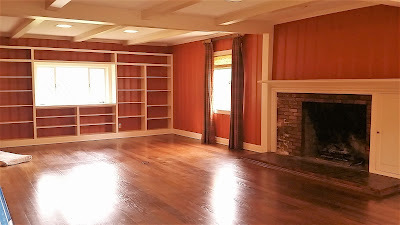 The space is defined by cabinetry topped with Doric columns, cabinetry I hope to one day remove. A massive 8 foot square French paned window takes center stage upon the front wall, framing the outdoors, while pulling nature inside. 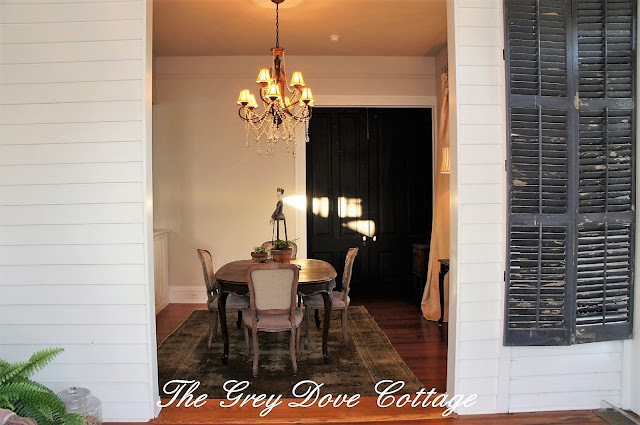 Original pocket doors create the opening to Mr. GDC's office. The natural finished pine floors provide another element, along with a bit of pumpkin color. The window is off centered, there is a step down that removes a few inches from one side, centering the rug would be a challenge. 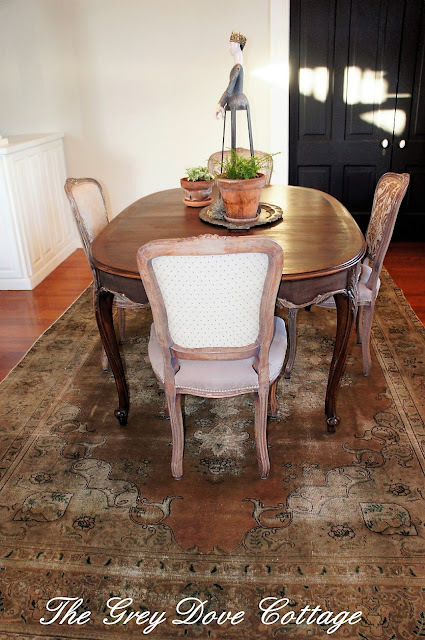 The rug had to be just the right size; wide enough to be able to pull the chairs out from around table without catching the back legs upon the rug edge, long enough to center in the room, yet not need to be cut around the step. 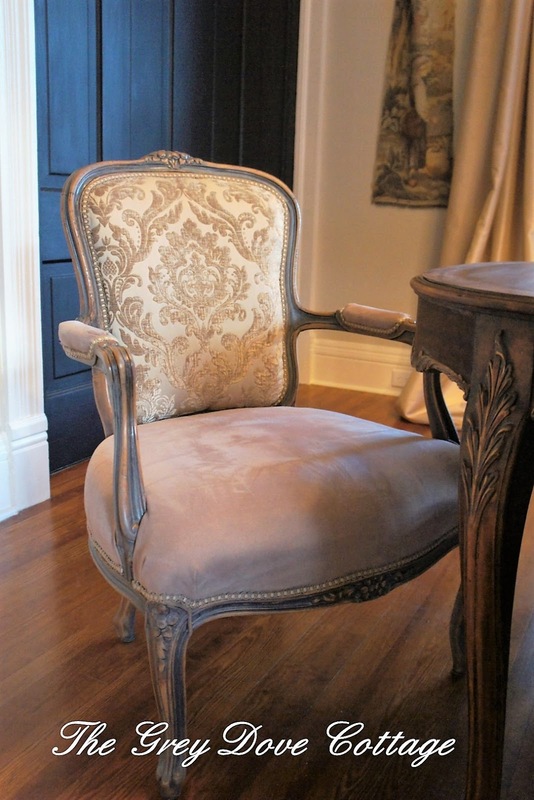 Mid-Century French chairs, covered in a combination of damask, harlequin, finally solid suede cloth. 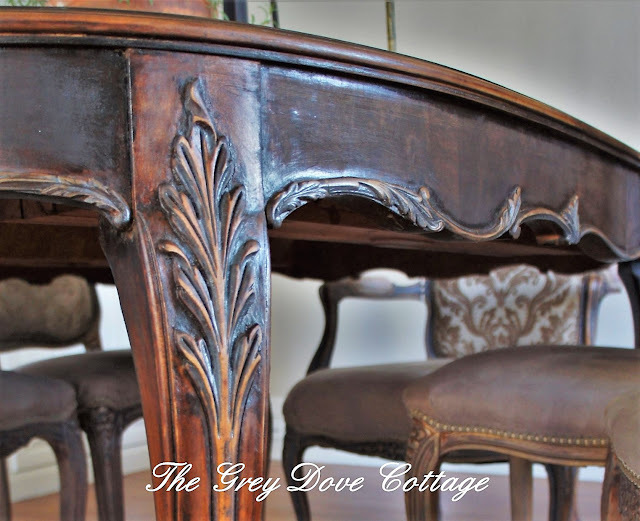 The frames finished in a grey wash, with dark stained details, then waxed for a dull finish. 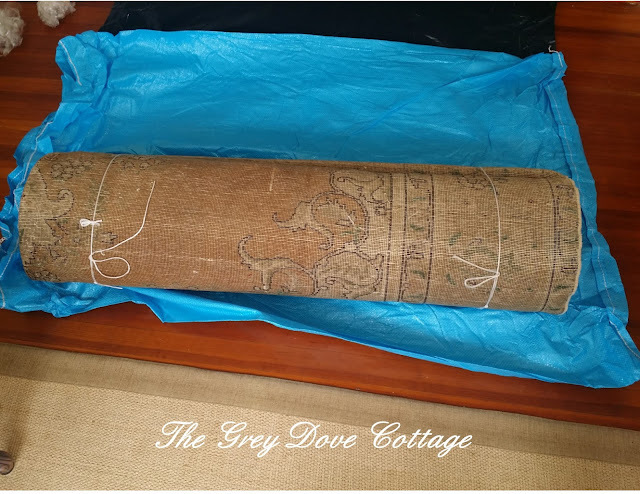 Antique French tapestry remnants, once a single piece. I separated the tapestry in the center, where it was torn 1/3 down, to create two narrow pieces. 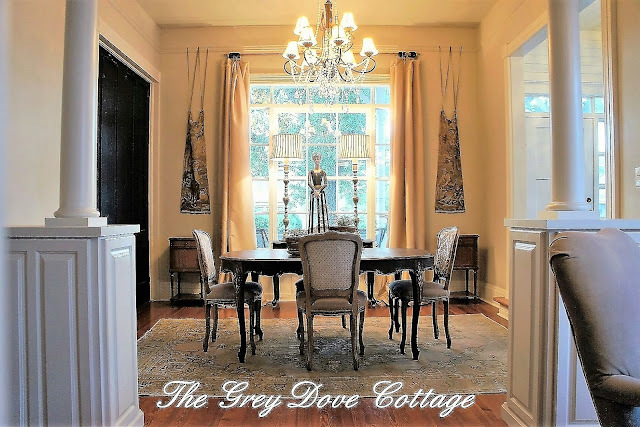 Hung by satin ribbon from the picture railing near the top of the room, on either side of the large French window they add texture, color, also patina. 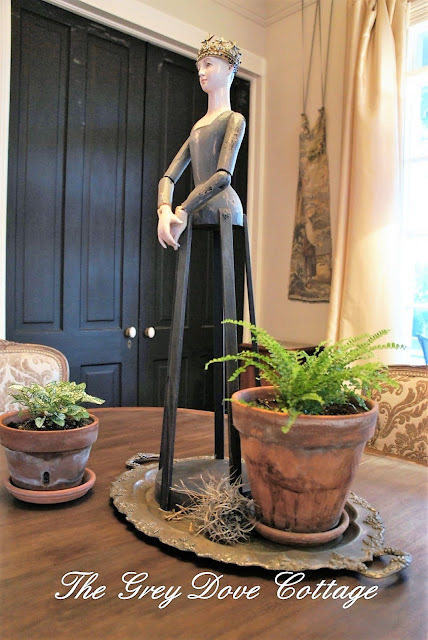 A replica Santos sits upon my Grandmother's antique, flecked silver serving tray, paired with simple clay pots filled with plants, to bring the outdoors in. Behind her; 1930's brass alter candlesticks, Mr. GDC wired into lamps, they are 48" tall. The finish on the candlesticks were rough, I washed them in pewter metallic paint, then rubbed them to reveal a bit of the original brass. Currently they are topped with pleated silk shades. A console table with cabriole legs, features a shell medallion, finished in dark expresso (for now, rethinking that finish), I use the table for serving during dinner parties. 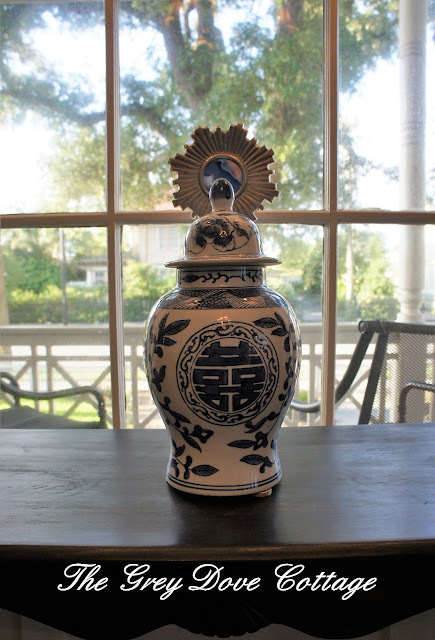 A blue and white porcelain ginger jar gifted to us on our wedding day sits atop the console table. Behind the jar a sunburst mirror I raised with a piece of all thread, then attached it to a block of Carrera marble - A little DIY project that reflects light. 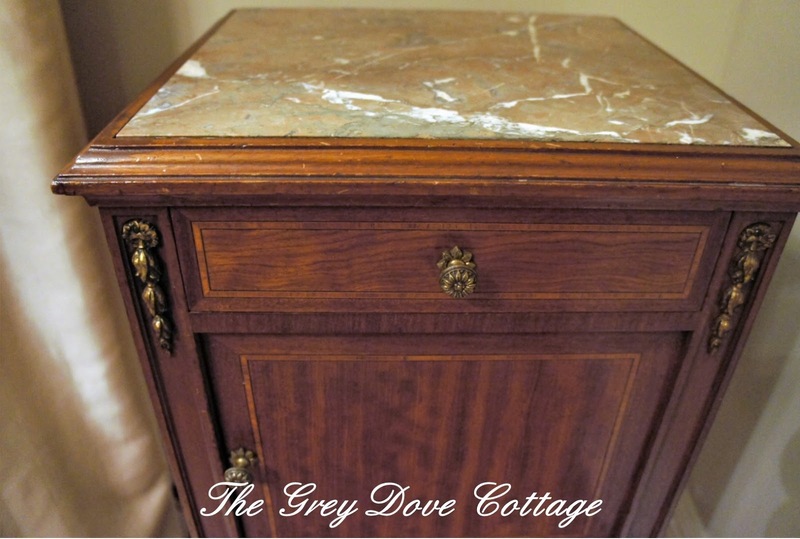 1860's Empire French antique cabinets; detailed with bits of bronze dorje, fluted legs, marquetry, then topped with marble insets rest below the tapestry remnants. The pair provide much needed storage, as well as additional serving surface. Finally a "big box" recent simple iron chandelier, the previous home owner drenched in old crystal prisms. He wired each string of beads, with various designed tear drops. 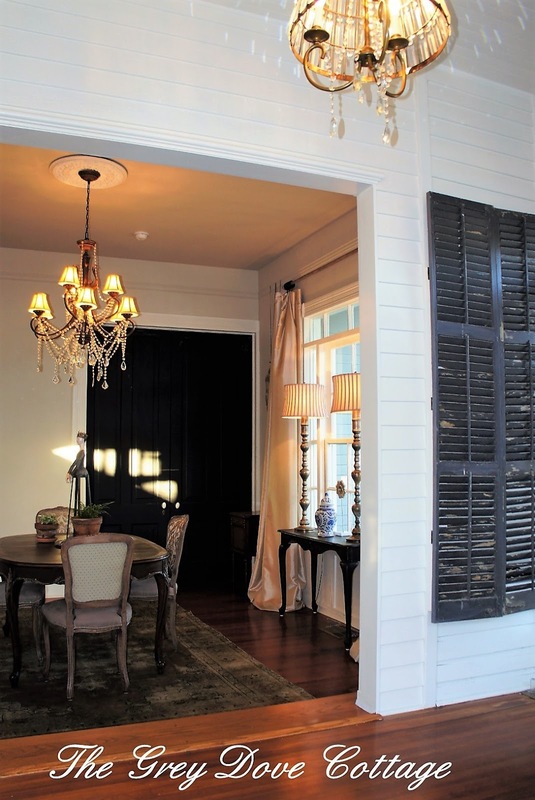 I added the shades to harness the light, directing it downward toward the dining table top. Mounted to the ceiling with a faux ceiling medallion. 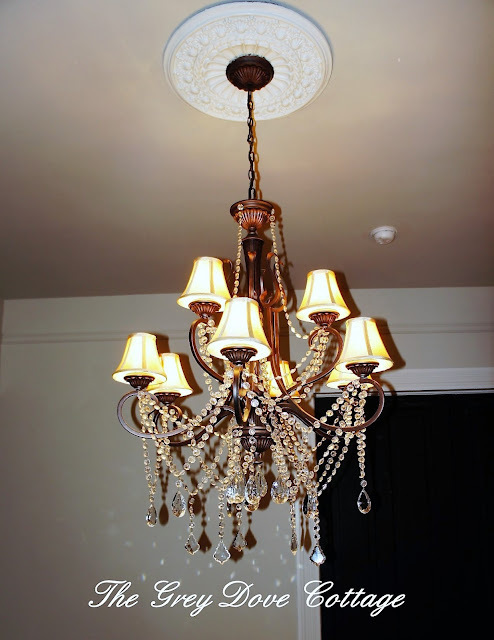 The chandelier is an large element in the space. 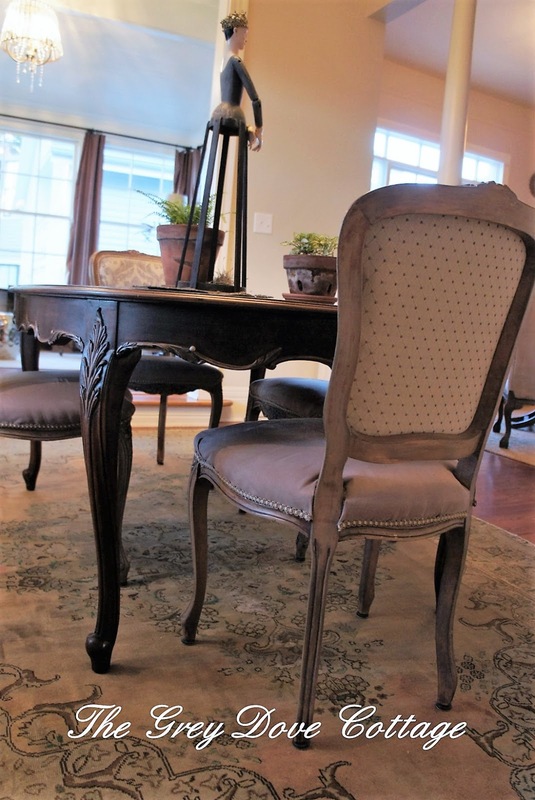 I began perusing estate sales, auctions, online, also in person. My heart decided on an antique Persian, a medallion pattern to reflect the oval table. While the rug was affordable, it was still expensive. I tend to be frugal. Did I write frugal? Perhaps squeaky, would be a better word. I don't easily spend money. I fret. The advertisement photo below shows the pattern well; the center medallion, the peachy beige field. I purchased the rug from an online estate auction. Fought for it actually, bidding, bidding, then finally won. The purchase included a 30 day return option, a safety net of sorts. I interrupted Mr. GDC's workday, to help move the furniture out of the way, then we rolled the rug out. Deflated I slowly collapsed to the step between the foyer and dining room. I sat, disappointed, staring, chin in had, elbow balanced upon my knee - pouting. I saved for months. My heart sank. I felt I should have waited. How could I have spent so much money on this rug? Heavy sigh, heavy heart, what to do? In a confident voice Mr. GDC said "I like it", then returned to work. 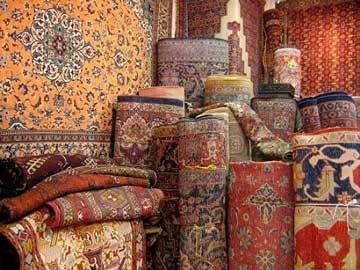 Jr. wandered in, accessing the rug as he walked about; "It came! It's awesome Mom, really old, I like the dogs in the corners. If you decide you don't want it, can I have it for my living room?" I glanced over to him, "meh". It wasn't love at first sight - the sight wasn't the issue, it was pretty, it worked well, the pattern, the muted colors, the patina, the size were all perfect. I felt an antique was the right choice, verses a new perfect rug, rich with color, I felt would have looked out of place. However, this rug didn't feel like a "good" investment. Corner dog detail, see him in the little medallion looking backward? With the enlistment of Jr., we flipped the rug over with the backside up. 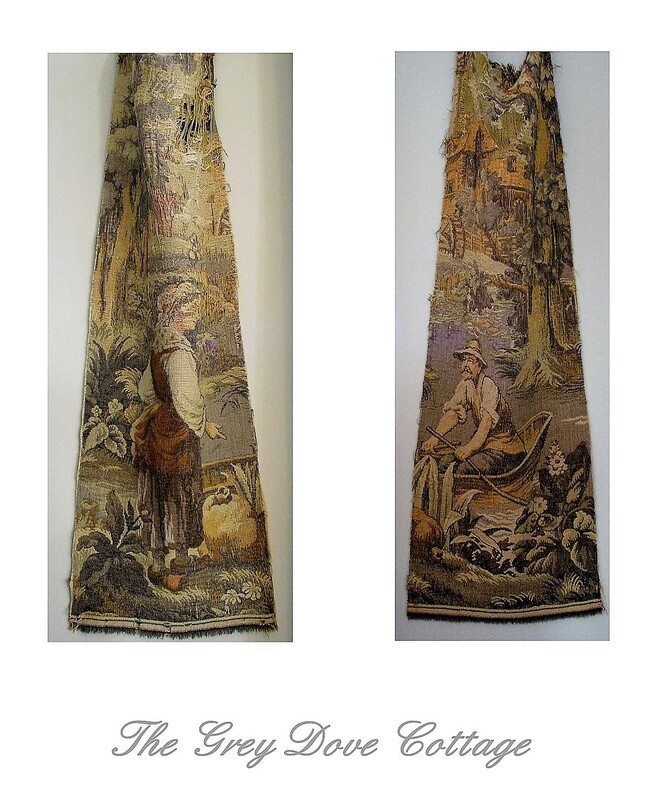 I'm known for preferring the backside of rugs. 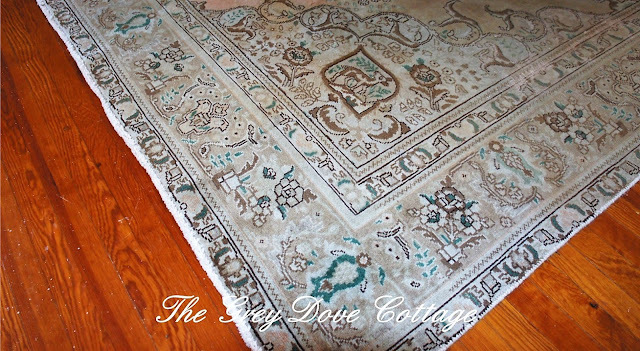 If you have a real wool, hand knotted rug, the back is as pretty as the front, although more textured, with a tapestry appeal. The backside is actually in more favorable condition, because it hasn't been walked upon! Yes, I know, counseling. Honestly, I prefer the backside. Carpet backside - You've gotta admit, backside is pretty! 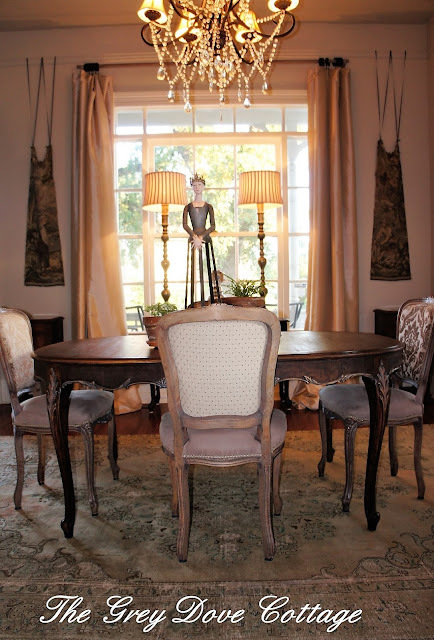 Undeniably with each day I couldn't help but notice the old, tattered, worn Persian somehow fit our Texas Gulf Coast "Sybi": the collection of French furniture, the recent chandelier, the 1930's alter candlesticks wired into lamps, the tapestry remnants, even our Santos seemed content. 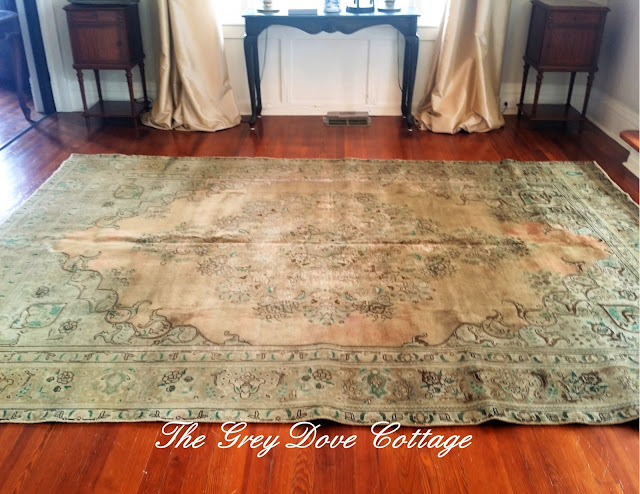 The morning light streaming across the Persian highlights the hand knotted pattern, the size is perfect for our quirky, off center, petite space; while the colors soft, yet somehow rich with depth provide pattern, as well as texture. Another view from the foyer showing the console table. View looking across the dining room toward the foyer. 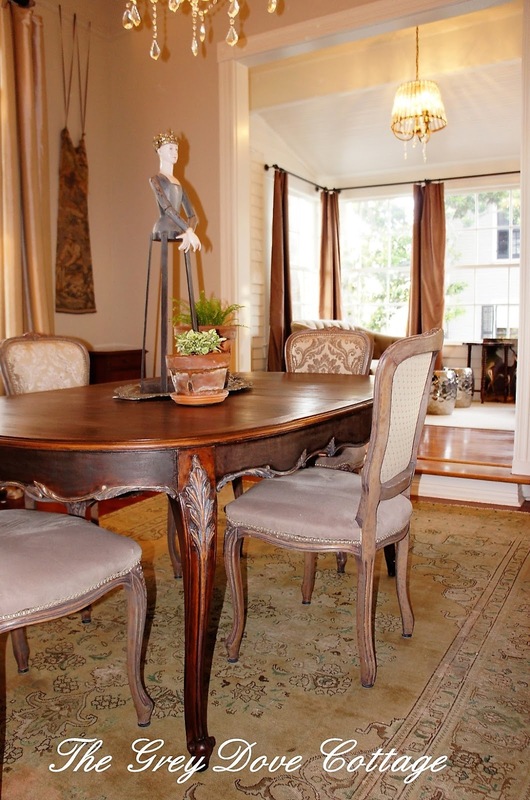 The carved table details paired with the pattern in the rug. View from Mr. GDC's home office. 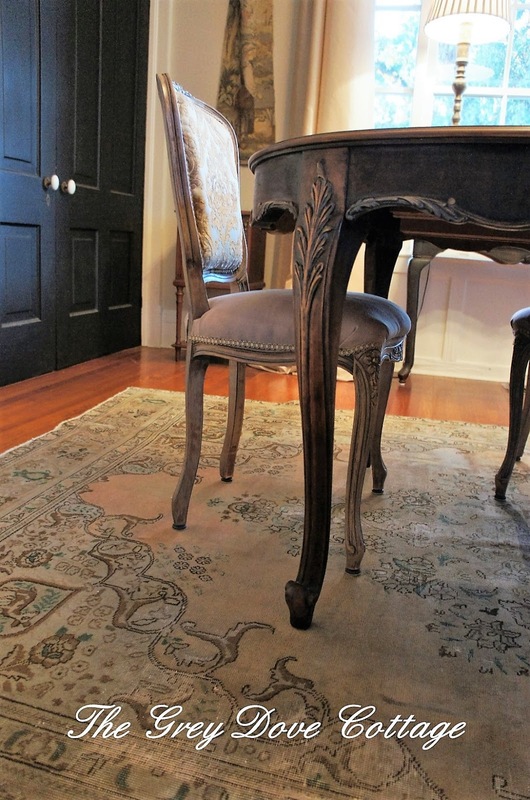 Multi fabrics worn by the chairs, paired with the rug. I've driven myself, my family, and a close friend a bit crackers with the rug search. Though I still have doubt in my investment, I recall my Grandfather often said "things are worth what your willing to pay for them". 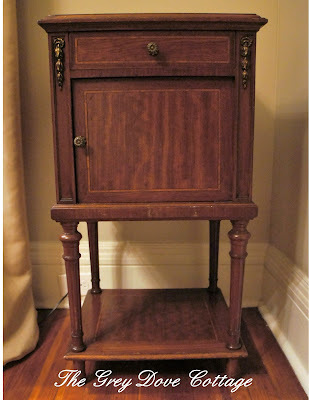 I believe the antique, worn, threadbare, muted, faded, Persian is a nice addition for our Sybi. After all, it's all about Sybi, isn't it? Next, maybe removal of those recently installed, inherited from the past owner, ill placed, unmatched cabinets. The cabinets don't reflect our cottage's Victorian heritage. The cabinet style are more craftsman, while the columns are Greek. They confuse me. They are purely decorative, not structural. I'm thinking of either leaving the space open or install a simple post on either side. Heavy sigh - someday.